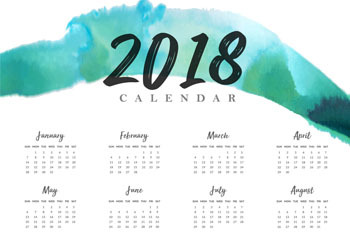 What to Do and See in the 1st Month of the Year? Budapest doesn’t sleep in January even if it’s the coldest month of the year. The Christmas and New Year festivities have ended and the Hungarian capital is packed with energy and ready for 2019. January is the coldest and drearest month in Hungary with an average temperature of cc. 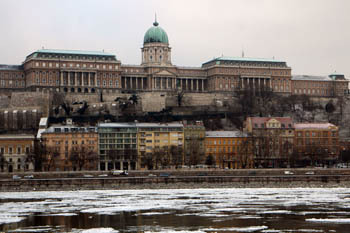 0.5 Celsius degree in Budapest (minimum: -1.6 C, maximum: 2.9 C). But this shouldn’t keep you from having fun and being active during your visit. Plan indoor and outdoor programs according to the weather forecast. Do your walking/sightseeing when it’s sunny and there’s no snow or drizzle/rain. If it’s very cold include more indoor programs. TIP: Budapest is famous for its classic coffee houses, but new wave cafe culture with specialty coffee shops opening almost every other week is also on the rise – see recommendations below). A nice cup of hot tea or chocolate will warm you up. A vibrant street market every weekend in the heart of the city’s party district. Saturday the Antique Vintage Market takes place, more a flee market, with all sorts of retro and antique pieces on sale. On Sunday, the GoArt! Gozsdu Art Market is the place where you pick up quality, handcrafted design and vintage art. 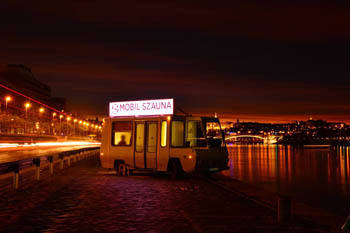 Warm up in a real Finnish sauna located on the riverbank, this year in Pest at the Rákóczi bridge. You can easily get there by the H7 Suburban Railway (HÉV) departing from Boráros tér. The Valyo Association’ (City and River Association) project welcomes everyone for the 3rd time in winter. Rental is donation based which is 15 000 HUF for 1,5 hours for 2 -6 persons. With the money you support the work of the association (known also for their Liberty Bridge Festivals on some weekends in summer). More information and sauna rental is available on the organiser’s website. The largest church of the city, St. Stephen’s Basilica gives home to a fantastic organ recital on 05. January at 20.00. The historic temple in downtown Budapest is a perfect place for a lovely winter concert. You can combine the concert with a cruise on the Danube for a whole night program. Franz Liszt‘s church also host concerts on Wednesdays at 16.00 performed by Gábor Szotyori Nagy on the historic pipe organ of the church. Concert lasts cc. 45 minutes. This lovely temple of medieval origin stands in the city centre at the Pest bridgehead of the Erzsébet bridge. 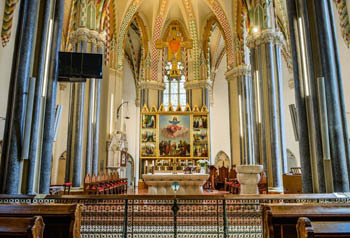 Find out where else to enjoy organ music in Budapest! It is part of a concert series by Ditta Rohmann cellist who will play selected solo works of J. S. Bach. Next concerts in the series will be on 15. February, 25. March. 22. April and 27. May. The Zoo & Botanical Garden is open all year round though with shorter opening hours in winter. TIP: If it’s too cold for strolling around the park view the interactive exhibits in the Magic Hill/Varázshegy. An excellent program with children! The Magic Hill is open: 10.00 – 15.30 in January-February. Warm Up in a Thermal Bath! 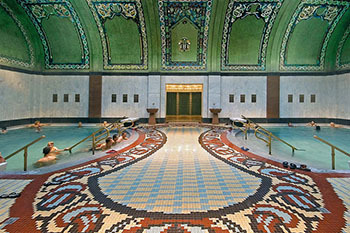 Budapest is known for its thermal baths fed by healing spring water. The best known spas are the Gellért in the Buda side and the Széchenyi (aka Szecska) in Pest’s City park. the Holy Crown of St. Stephen for free. Visitors may enter the building from Alkotmány utca. Due to the great interest prepare for queuing! hamburger and pizza – all vegan. Even if you don’t like beer try the hot version in the Bálna Bisztró in mid-January. It’s a popular drink in Poland and said to be a perfect cure for common cold or relieve the symptoms of flu. Besides hot beer, you can also have fragrant hot wine. 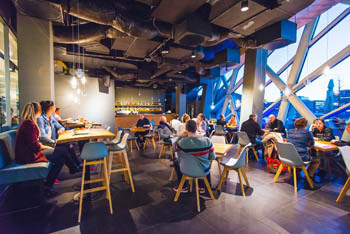 The Bisztró is also an excellent place for a breakfast or brunch, lunch or just a cocktail or coffee. The terrace offers an amazing view of the Buda side and the river Danube. TIP: The ice rink in front of the Bálna is open till end of February. Skate rental is available for 1 000 HUF/3 hrs. See more places for ice skating below. This is another winter drinks-themed festival on the promenade in the Allee Shopping Centre in Buda. 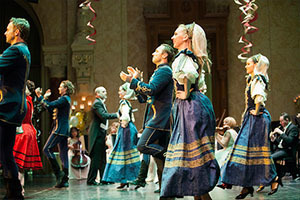 Spend the 1st day of the New Year on a splendid concert in a historic palace located in the city centre! 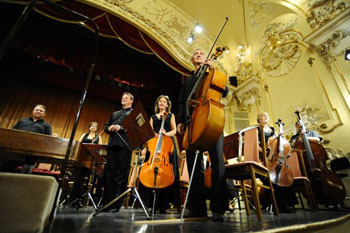 The Danube Chamber Orchestra will perform at 17.00 presenting evergreen classical melodies to the audience. 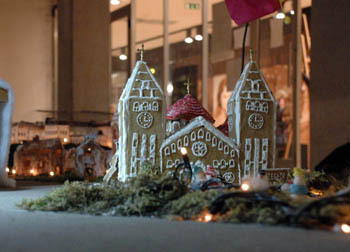 Christmas Market by the Basilica, till 01. January 2019. The festive fair on Szent István Square right in front of the Basilica is on till 1st January. On new Year’s Day you can enjoy the 3D light mapping show projected on the facade of the Basilica between 16.30 till 22.00. You can also have a delicious meal at one of the handful of food vendors and warm your hands with a glass of mulled wine or hot tea. The city’s famous holiday fair at Vorösmarty Square closes on 01. January 2019, but only the food and beverage stalls are open offering real Hungarian treats like stuffed cabbage, roast meats, lángos and chimney cake. A huge selection of hot and cold drinks are also available. 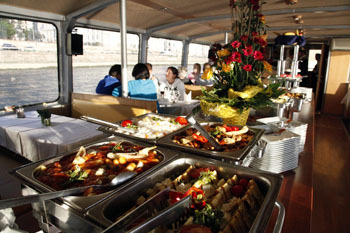 View the superb night panorama of Budapest from a deck of a boat while enjoying a buffet dinner with drinks. 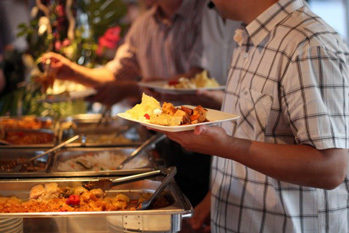 TIP: If you prefer to go on a daytime cruise take the one with buffet lunch starting at 14.00 . Get a taste of local culture by attending a 1,5-hour folklore performance presented by one of the most talented folk ensembles of the country. Tickets are available in 3 seat categories. TIP: You can travel on one of the the Christmas Light Trams till 06. January. Tram 2 is the best if you want to see the most famous sights of the city dotting the riverbank. The festively decorated tram 2 runs on 01. & 02. January after 17.00. What to do in February?